It is the Mother from Hell who opens this novel as her son Gustav arrives at JFK Airport to spend his va-cation with his family in upstate New York. As they set off across Manhattan, Mother has words for Gustav, his Sephardic wife, his Orthodox business partner, his dead father, and everything else in the world. Mother is so distracting that Gustav makes several wrong turns and ends up on the wrong side of the river. Where to cross? They arrive at the Tappan Zee Bridge, but traffic comes to a halt. Construction. A wrecked truck. They’re stuck. It’s going to take them a long time to cross the Hudson. Peter Stephan Jungk, a former screenwriting fellow of the American Film Institute, is the author of an ac-claimed biography of Franz Werfel and The Perfect American, a fictional biography of Walt Disney’s last months. 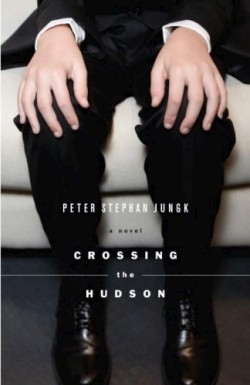 The details in Crossing the Hudson show his familiarity with New York, Los Angeles, and several European cities, giving this novel about the troubled generations of a post-War Jewish family a verisimilitude that draws readers in. Actually, as the family history is revealed, it turns out to be a complex, haunted family from Hell, and Gustav’s day on the bridge across the Hudson is a day from Hell. But Jungk’s telling of the story is irresistible.